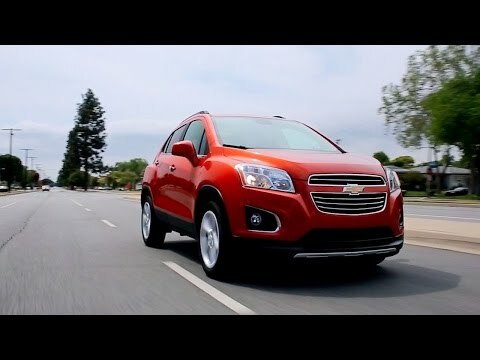 With its unusual abundance of cargo and storage room, the 2016 Chevrolet Trax is the compact SUV that feels bigger than it actually is. Good fuel economy and zippy performance come courtesy of a 1.4-liter turbocharged engine and 6-speed automatic transmission. Cuteness comes at no extra charge. Right on Trax! Spacious. Bluetooth. Sirius radio. Rear camera. I adore this car. It is roomy without being monstrous, and can add more space by folding down seats. I love this feature when I go garage sale shopping. The things I would change are the pick up, especially highway pick up, it can be a challenge to get her moving to the pace of the other cars on the road. My husband does not like the dashboard, and finds it difficult to see out because of the rear view mirror which I admit takes a bit of getting used to. It seems to take up a lot of space on front window. The Trax is comfortable for me but my husband finds it awkward. I love the rear camera for reversing and making sure there is nothing behind me. I also love the radio, and Sirius. The Bluetooth is a great feature too! Have the regular services done on time check oil often read reviews don't buy. The brakes needs replaced within a few months than it began missing real bad and using oil than it was completely out of oil and the check engine light never alarmed me than the coolant was empty I put coolant and oil in and it was ok for a little while it has no temperature gauge a all I never knew it was overheating until I saw smoke. Only when the check engine light came on was I able to get service than it was 7000 miles out of warranty they did end up covering it the camshaft 02 sensor and coil pack were all bad and needs replaced a only 2 years old and I was off work 9 of those months so I barely drove it. I will never buy another one. Reliable but a little small. This vehicle has great gas mileage and is fairly comfortable. It has been very reliable. I have had one problem with it that the dealership fixed, but they couldn't explain what happened. The computer was shutting down and acting as if the battery had been jumped backwards, but it hadn't been jumped nor used to jump anyone else. That aside, I have no real complaints. It is a little small, but if you desire a larger car the Equinox is probably more appropriate. As a side note, my package does not include cruise control and I think this is lacking on Chevys part as that should really be standard.